This recording captures the first night on August 2nd, but it is not without its drawbacks. First, despite it being a soundboard source, there is still a fair amount of hiss and obvious warpage on the master tape. Considering this show is nearly 24 years old, that is no surprise. This is also not the complete concert. The recording of “Anotherloverholenyohead” is cut off and the tape does not continue until the very ending of “Pop Life”, meaning the performances of “Soft And Wet”, “I Wanna Be Your Lover” and “Head” are not included here. Also, this recording ends after “America” meaning the last five songs performed on the evening are also not here. So if you are looking for a complete show there will be some disappointment, but again the fact this is a soundboard recording is the selling point here that still makes this a must have. As for what is contained, this is a fairly standard ‘Parade’ era show. Prince had expanded The Revolution to include, amongst others, saxophone extraordinaire Eric Leeds and Atlanta Bliss on trumpet, so there is a strong emphasis on horns playing what were formerly keyboard lines, as well as extended solos by Leeds throughout. This show was much more of a soul and funk review, with Prince rarely on guitar thanks to the addition of Miko Weaver to the band. Despite the fact this hour long CD has 20 tracks, many of the songs were brief snippets of classics like “D.M.S.R.”, “Automatic” and “Delirious” that Prince would have the band touch on then move on to something else. Very few songs are performed in full, often maybe a verse then moving on to the end, giving the whole show the feel of one long funk workout. There is no denying The Revolution were a funky force by this point and that is best exemplified when they are given time to stretch out and jam. 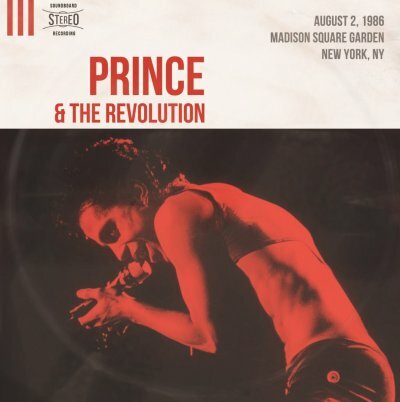 As often was the case during these shows, The Family’s “Mutiny” turns into an extended nine minute jam session, with Prince incorporating some of “Ice Cream Castles” by The Time, albeit with a revised chant of ‘We are young, we’re not old and we are funky!”, along with chants of ‘The roof is on fire’. The closing “America” is another highlight as Prince and The Revolution go for nearly twelve minutes, including Prince getting behind the drum set for a killer drum solo. It’s also one of the few songs here where Prince is on guitar and it provides a huge burst of energy to close out the CD. As always, one of the charms of hearing live shows, even when the set is fairly standard, is catching off the cuff comments made onstage. Especially when you’ve heard multiple shows from the same tour, it is these moments that can make a particular show stand-out from the rest. Here, Prince gets candid during the intro to “Do Me, Baby”, sharing the following with the 20,000 in attendance. “New York. Let me just take a moment…let me just take a moment. First of all, I’d like to thank each and every one of you for coming out this evening. Listen, I got something I wanna tell you. When I was 17 years old, I ran away from Uptown and I came to New York City looking to be a big star. Check it out. My sister had to work so uh, she left me with one of her boyfriends, his name was Bill. So Bill said, ‘Prince check it out, I want to take you over one of my other girlfriends house.’ I said ‘ok’. On the way we went through the subway and uh, we stopped through here and he said, ‘This is where the Knicks play basketball and this is where all the big stars come. Maybe one day, you’ll make it.’ Now I know that’s kind of corny but I just had to say that because I’ve been trying to get here for a long time. I really love all y’all, thanks for coming out, I swear to God, from me to you.” It’s a really cool moment, especially considering how out of touch and incapable the Prince of today seems to be at displaying sentiment. The verdict on this one is easy. Yes, it would be wonderful to have this in complete form in this kind of quality, but I’m not going to turn up my nose at new soundboard recordings. It is still an essential addition to a Prince fan’s collection and it is again much appreciated that shows from this long ago continue to turn up in superior sound quality. Who knows what will be unearthed next?